In 2017, the painter Sebastian Heiner (*1964) worked for six months in Shanghai – an overwhelming megacity. Together with the photographer and designer Michael Wruck, he produced Moloch City: “For the first time in the many years that I’ve known Sebastian Heiner, I experience the daily environment in which his works are created: the ritualized walk to the studio in the North Bund Art Zone, the preparation of a canvas, the mental warm-up, and finally the actual act in which an image is created. 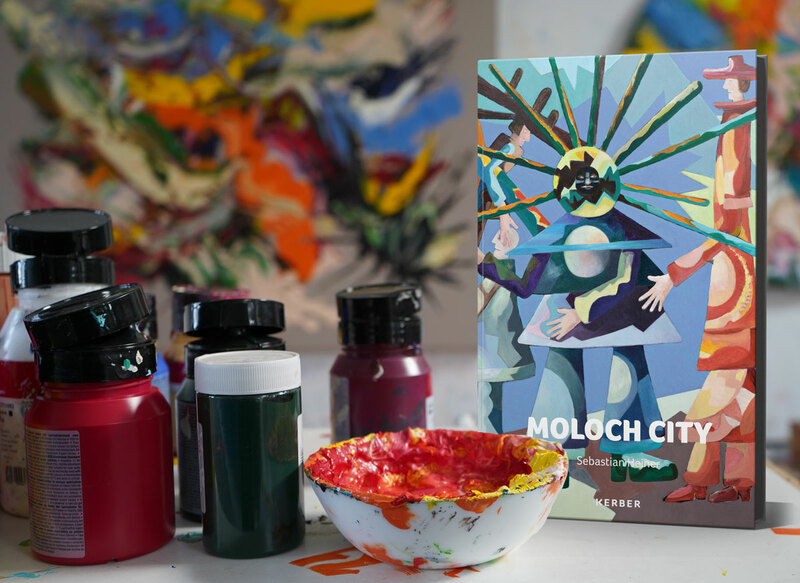 In the past six months of our trip to China, it has become increasingly clear to me that Sebastian Heiner’s works are often closely connected with everyday experiences.” Moloch City is both a travelogue and documentation of Heiner’s painterly oeuvre. Intimate drawings and gestural painting, precise photographs and artist’s texts between dream and reality all come together to create a large mosaic of impressions and thoughts about an unknown city, an unknown country, an unknown culture, which simply must “make their way out”.